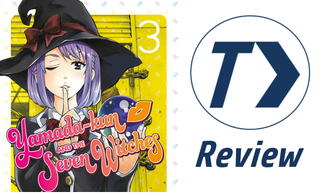 For a series supposedly about seven witches, Yamada-kun has taken a while to get to the ‘seven’ part, but it was most definitely worth the wait. Fans of rom-coms and slice-of-life will enjoy Yamada-kun, especially if you are looking for quality humor. I felt like Yamada-kun and the Seven Witches began to get into the primary conflict this book, namely the obvious fact that there are seven witches. The primary focus of the narrative is about Nene Odagiri, Miyamura’s rival for student council president and a witch whose kiss charms people, causing them to fall in love with her. Odagiri is interesting both because of the shift in character dynamics she offers as well as the reveal of Yamada’s ‘backstory’, more or less, which is essentially an explanation for why he is considered the school thug. The fact that Yamada even had a backstory was surprising enough, but it was actually kind of interesting how the witches have been involved in his life without him ever even realizing it. Odagiri herself is both self-absorbed and power-hungry, a combination that might sound slightly familiar for a series antagonist. However, she isn’t really set up as the antagonist despite having her own motivations for doing things. Her power to charm basically doubles the hijinks possible for the group since now instead of just switching bodies there are more abilities to cause chaos. The new ability also keeps the series feeling fresh instead of just stagnating with similar situations, and I feel like future volumes will continue this trend with the other witches. Additionally, by shaking things up for the Supernatural Studies Club, Odagiri finally makes the group realize that Yamada is not a witch and merely copies their abilities, something that sets up future volumes as Yamada is made to be more or less a witch detector. She also manages to create some interesting situations for Yamada and Shiraishi, and although their relationship doesn’t make much progress it does play out interestingly enough anyways. Although the main conflict has begun to appear, Yamada-kun has not lessened its comedy. The mangaka Yoshikawa’s facial illustrations are really excellent at capturing the hilarity of certain moments, of which there are quite a few, and Yamada continues to basically get made fun of by the members of the Supernatural Studies Club. The kissing scenes also continue to be pretty equal opportunity, as just about everyone in the group gets some action on that front for the sake of testing abilities. I’ve always really appreciated the minimal fanservice (outside of the kissing, which is fair game), as the humor doesn’t come from annoying fanservice scenes and instead comes from quality slapstick bits. Yamada-kun and the Seven Witches begins to start living up to its name in its third volume with the introduction of the second witch and a new set of powers. While the new characters and developments are interesting, the series maintains the elements that have previously made it great, such as the slapstick humor and amusing illustrations, and sets itself up for an interesting story. Yamada-kun and the Seven Witches was authored by Miki Yoshikawa and published by Kodansha Comics USA on July 28, 2015. Yamada-kun is an ongoing series in Kodansha’s Weekly Shounen Magazine imprint, and received a single-cour anime adaption by Liden Films in Spring 2015. Volume 4 will be released in English on September 1st, 2015.